Ban Chiang is considered the most important prehistoric settlement discovered in South-East Asia. Discovered in 1957 it attracted enormous publicity due to attractive red painted pottery. The first scientific excavation was made in 1967 and uncovered several skeletons together with bronze grave gifts. Rice fragments have also been found, which prove that the Bronze Age settlement was made by farmers. The oldest graves found contain no bronze and are therefore from a Neolithic culture; the latest ones are from the Iron Age. Oh, how I love WHS like Ban Chiang (BC) - It may not offer iconic monuments but it is relatively infrequently visited and uncrowded and covers a lesser known but interesting/significant historical period/culture. It also has plenty of “issues” regarding its inscription and recent history together with opportunities for “post-visit investigation”!! At the time of its discovery in 1966, BC experienced world-wide fame as the cradle of a “newly discovered civilisation” which had independently developed its own bronze making technology. This was followed by archaeological controversy and revision of timescales. Meanwhile its treasures suffered looting - leading to international action to try to recover them. As a result, its pottery artefacts fill private collections Worldwide and grace musea in USA, London and Berlin. I report (at some length!!) on some of the “issues” below in the light of our visit in Nov 2017. Press articles from the period give a flavour of the excitement which initial assessments of the place of BC in World history engendered. NYT (Jun 8 1975) - “If dates indicated by recent technical analysis are correct for BC pottery then, by inference, the bronze found in the same graves was made in 4500BC too and that’s 1500 years earlier than anyone ever expected it could be made and in a part of the World where no one ever expected to find metallurgical practices at such an early time”. See - this article. Similarly, this Washington Post article of Sep 8 1975. It was all wrong of course. In 1971 the thermoluminescence technique used on the original pottery which contained the bronze articles gave spurious results, and later radiocarbon tests resulted in their date being adjusted to 2000BC. Subsequent assessments brought this even further forward to 1500BC. Nevertheless the original wording of Criterion iii accepted by ICOMOS/WHC in 1992 (by which time the original estimates had already been discredited) stated -“BC was the centre of a remarkable phenomenon of human cultural, social. and technological evolution in the 5th millennium BC, which occurred independently in this area of south-east Asia and spread widely over the whole region.”. Criterion iii on today’s UNESCO Website reads - “BC Archaeological Site was the centre of a remarkable phenomenon of human cultural, social, and technological evolution which occurred independently in this area of Southeast Asia and began at Ban Chiang around 1500 B.C. and spread widely over the whole region” So, whilst “correcting” the date, it still uses the phrase “occurred independently”. As far as I can make out, this view is not supported by experts. The BC museum itself acknowledges the “thermoluminescence error” but is not consistent regarding dates for bronze making, stating at one point “began to smelt ores and cast sophisticated bronzes some time after 3000BC” and, elsewhere, “The ancient population of BC cast bronze objects from at least 4000 years ago”. The doyenne of excavation at BC, Joyce C White of Penn University - has (2009) published on the issue of how bronze technology might have reached S.E Asia and “independent development” doesn’t figure. But - was it transmitted by trade etc from dynastic China or from elsewhere? She considers the range of possible dates for its arrival (including as early as 2000BC) as well as the detailed methods of production and forming and concludes that there is a good case for an early transmission from the Nomadic Steppe-lands of S Siberia/the Altai through the Gansu corridor (not of course “Chinese” at that time but from earliest days an important “route” for the transmission of “technology” e.g Cultivated wheat from Fertile Crescent). See this link. The current status seems to be that the matter of “Bronze Age” dates is still the subject of scholarly investigation whilst recognising 3 “official” periods - a. Early (Late Neolithic - “Early Bronze”). 3600 - 1000BC b. Middle (Bronze - Early Iron). 1000 - 300BC c. Late. 300BC - 200AD The BC Bronze Age itself is now described simply as “A distinctive Bronze Age” - this seems to be because no evidence has been found of a hierarchical society/warfare etc which, elsewhere in the World, have always accompanied the use of bronze. Prior to BC there had only been limited study of SE Asian prehistoric cultures and the area was regarded as something of a cultural backwater. As well as the “Bronze Age” issue, BC has also provided insight into matters such as plant and animal domestication through its extended time horizon. Thus, this AB evaluation comment still has some justification despite the Bronze Age issues - “BC is without question the most important prehistoric settlement so far discovered in south-east Asia. Within its cultural sequence of some four millennia it presents the earliest evidence for true farming in the region and for the manufacture and use of metals. It is. moreover. not merely the type-site for this prehistoric culture: its long cultural sequence, size and economic status has no parallel in any other contemporary site in the region”. a. The fine “National Museum” originally opened in 1981, extended in 1987 and refurbished in 2006.
b. An “Archaeological Excavation Pit” 1km away at Wat Pho Sri Nai. b. Some trenches at a genuine excavation location around 1km away (Photo). Those trenches would appear to have been significantly altered from their original state in order to preserve them from collapse etc. Also the archaeological remains within them would seem to be replicas. In 2012 the site was described as covering “67.36 ha of which approximately 0.09% has been excavated” – so, under the village (and thus “inscribed”), lie (probably/possibly!) many more remains. It is worth noting that, although the site is sometimes described as a “necropolis”, this is not strictly correct. It is true that the main archaeological value of the site lies in its graves and grave goods but the culture seems to have practiced "residential burial" under the home rather than in a separate area. Also, although BC has become the “Type Site” for the period and culture and grabbed the fame, it is by no means unique. Indeed excavations at another site in the same geographical area (Non Nok Tha) even predated those at BC. 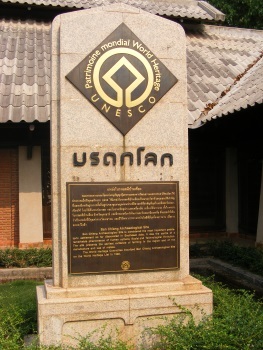 The Museum contains a map showing 127 sites, both clustered around BC, and scattered across the Khorat Plateau, which are considered to represent the same culture. But, what of the AB’s statement – “The unexcavated part of the prehistoric settlement is intact and there is little threat to any part of it”? The former statement is untrue whilst the latter may well be true now but was still open to question when it was made back in 1990 and was certainly untrue before then. It cannot be known for certain how much undisturbed material still remains under the village but, as early as 1982, archaeologists reported failing to find a single undisturbed site among those they investigated and undoubtedly enormous amounts were illegally dug up and exported – “By the 1980s BC material was flooding the international market. “I’m told that some 40,000 pots have come out of BC, excavated from the site,” said Mr. Young, the former Harvard student ….. He said he never collected the work himself out of concern for his family’s reputation and now owns only one pot, a gift from a Thai princess. Other collectors did amass the material, however, especially in the 1980s and ’90s. The objects were abundant and, by comparison with other antiquities, cheap — typically under $1,000. It was mainly during this time that leading American museums secured donations and, to a lesser extent, made acquisitions to help fill gaps in their Southeast Asian collections.” (NYT Feb 17 2008). If you search on “eBay Ban Chiang pottery” you will find plenty for sale – one can be yours for as little as $200 (Whether they are all genuine might be another matter!! Indeed “A recent study by Denis Byrne has moreover revealed a complex relationship between ancient and new ceramics at Ban Chiang, where pieces of ancient pottery are deliberately included in the ware of the newly made ceramics”!). A Royal visit to the site in Mar 1972, together with a July 72 decree specifically banning trade in BC artefacts, signalled an attempt to control such looting. It also heralded a start along the road to construction of the museum and inscription. But “but by 2001 it was clear that looting had recommenced at Ban Chiang and at other sites in the area, and that large quantities of material were reaching the United States”. In 2008 Federal agents carried out raids on museums and private collections, and, in 2015, a San Diego museum was ordered to return its BC artefacts . The problem is ongoing – but how much from BC itself and how much from other sites of the culture isn’t clear. Finally a few words about the Museum. It is spread across several buildings and floors and is excellent, both in describing the site and the excavation/scientific processes. All signs are bilingual Thai/Eng. IMO, to “do” it properly will take at least a couple of hours - having reached BC you might as well stay there as the “excavation” is only going to take c30 minutes. It would also seem that the fine pottery, bones and bronze artefacts on show in the museum are all genuine. At one point we asked ourselves “haven’t we covered these aspects before?” It turns out that this is because the museum incorporates (Gallery 7) a travelling exhibition “Ban Chiang - Discovery of a Lost Bronze Age” put together by the University of Pennsylvania which travelled USA (e.g The Smithsonian) and Singapore from 1982-6! A further indication of the high international “profile” which BC possessed in those days. We visited the Ban Chiang National Museum in January 2016. This archaeological museum is located ca. 50 km east of Udon Thani, the provincial capital. It is a wonderful museum with a great exhibition. All items on display are described with labels in Thai and in English. The presentation is excellent. We recommend you set aside at least two hours to go through the exhibition. There is a lot to see and to learn here. (1) The museum uses double pricing. Thai citizens may enter for 30 TB, while foreigners must pay 150 TB. Foreigners have to pay five times more than Thais! How can the museum think that this makes the foreign visitor feel welcome? (2) The museum has produced a guidebook about the collections. The book is available in Thai and in English. The price is 100 TB. We could see the books in a glass counter opposite the counter where you buy the tickets to enter the museum. But it was not possible to buy the guidebook! Why not? We were told that the member of staff who has the key to the glass counter was not at work on that day. So they have the book and we could see the book, but it was impossible to buy it, because the person with the key was not present! The person who sold the tickets did not care. She just said: "No staff today." How can the director of the museum allow this situation? Why is the person who sells the tickets not allowed to sell the official guidebook? The museum is highly recommended, but the administration of the museum should be fair (no double pricing) and should be more modern (the book shop should be open when the museum is open). Before my visit on Ban Chiag I have no idea about it. i visited on May 2005. it is simply a interesting Archaeological site. To reach Ban Chiang I took a bus travelling from Udon Thani to Nakhon Phanom which dropped me at the turn-off for the village. Here several tuktuks were lined up awaiting potential customers, so I hired one to travel the 6 km to the National Museum. This brand new building housed a plethora of information, not only about the Ban Chiang excavations but also about life in the region thoughout the ages. Afterwards I walked the 500 metres to one of the excavation sites, located in the courtyard of the Wat Pho Sri temple. This site was slightly underwhelming, and would have been quite meaningless had I not visited the museum first. 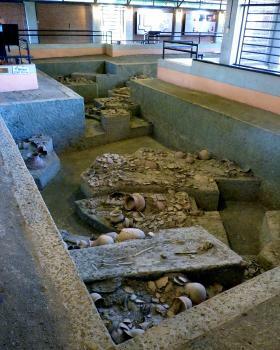 Beneath the soil of the village of Ban Chiang in Northeastern Thailand is where one of the oldest Bronze Age civilizations discovered in Asia with its unique designed potteries which can be found in many important museum in Europe; however, the site itself maybe the least visited WHS in this country. My visit to Ban Chiang happened while I was on my way to Laos and stopped at Udonthani which is the nearest city to Ban Chiang Village. Just only 45 minute from Udonthani, I was at the village of Ban Chiang, the village was quite large and located on the big hill and decorated with many supersize reproductions of Ban Chiang potteries. The archeological site itself was divided into 2 areas, which I visited them both. The first area was the Ban Chiang National Museum; the museum itself was very well displayed of all discoveries in the area especially from the main archaeological sites behind the museum. From the museum I went to the second area, this area was located inside the Buddhist temple with smaller archaeological site showing many skeletons of ancient people and countless potteries. I had to admit that I had no idea how to compared Ban Chiang with other archaeological site as this place is quite totally different from other archaeological site I had visited, small but very interesting, and its potteries were really beautiful. This humankind civilization was really unique that have to be seen and admired on. Ban Chiang,in my opinion, another great World Heritage Site. My wife and I visited Ban Chiang on 1/11/04. The directions to the museum were a little bit unclear, and to the excavation site, they were non-existent - at least in English. The new buildings were under construction for the new museum facility. The exhibits were those for the traveling exhibit. These were still very good exhibits. We hope to be able to go to the site again when the new buildings are open. We visited this web site because there was no information available at the museum for us that would provide more extensive information that had been part of the exhibit. It would be very helpful if something additional could be offered for sale that covers the subject more and provides photos. We found publications at other archeological sites, such as Wiang Kum Kam, Ayuthaya, etc. The excavation pit had been undergoing some work as well. Many bags [of archeological materials?] were stacked on the side of the excavation pit and some access to viewing the site was barricaded. Some of the skeletal materials and ceramics could still be seen in the side walls. The profiles had not been cleaned recently, so the profiles were difficult to see, but some detail was evident. As an archeologist, I truly hope the excavation site becomes more prepared for interpretation for the public for their education. This is a very important site and needs more public awareness and exposure to both Thai people and foreign visiters. Few tour books highlight this site, and we sought it out because of our personal interest. It would have been exciting to see the results of additional research incorporated into the museum presentation, and planned excavations or continued research, especially in light of more recent techniques available for analysis of artifacts and human remains. This would provide a more dynamic and exciting exhibit. Perhaps these things haven't been done because there is no one doing them, or there is no money available to fund them. This is the kind of site I would truly love to work on after being in this profession for 25 years! If there are any excavation opportunities, I would certainly like to know about them. Thank you for an absolutely wonderful experience!! Cemeteries: "The 1974 excavation of Ban Chiang revealed Bronze Age graves over a Neolithic cemetery,.."